This is a nice programme from my old colleagues at Children’s Miracle Network. They are tapping into the incredibly big and lucrative gaming community to raise funds. Clever to be piggy-backing on something that people are already doing. I know nothing about gaming, but I know how popular it is, and if you look at some of the top fundraisers on the site, they are raising some serious money. Play your favorite Xbox 360® games on October 1 and raise money for children’s hospitals. Sign up to participate and gather donations from friends and family — the more you play, the more they give. Click on the Register Now! button to register and create your personal fundraising page. Raise money by asking your friends and family to donate money for each hour you plan on playing Xbox 360 games on October 1. Play video games on Xbox LIVE on October 1 for the number of hours you promised. So start gathering donations from friends and family today! I read the recent Barclays Wealth report with interest. In it the report suggests that philantrhopists should take an alternative view to their giving strategy and start to look at some of the less traditional routes and instead look at more innovative routes to solving issues. I found this interesting in isolation but then a conversation I had with someone last week about corporate charity giving suggested to me that this approach could move beyond this report into other areas of philanthropy. The conversation I had revolved around a companies charitable activity. It was suggested that companies could be or are already fed up with the traditional routes of supporting causes and in many ways they are just going through the motions. But if they were to stop and think about it they would really like to be making an impact, a real impact (yes Im back to talking impact!). The person I spoke to suggested things that are similar to this report (although on a different scale). So with that in mind, it is well worth looking at this summary of the report and if you have time to look at the full report (here) do. I think this could really start to penetrate into broader thinking on charitable giving over the coming months and years…so how can you be a leader in this thinking? A groundbreaking new report, published on Monday, September 19th 2011 by Barclays Wealth, highlights some of the most expensive social issues in the UK – with the combined costs identified in the report approaching £100bn each year. Taking a ‘return-on-investment’ approach to philanthropy and applying economic analysis to UK charitable giving, the report explores how private funders are well placed to help tackle the root causes of these issues. Such efforts can bring significant savings to public finance, as well as improving the lives of individuals and their economic prospects. The report argues that early intervention is vital in tackling those issues which can contribute to entrenched social problems at a later stage. Furthermore, funding early-stage, preventative approaches can bring about significant economic savings for the state. The report identifies that there are currently 1.3 million young people in the UK with serious behavioural issues. According to one case study, the cost to society of dealing with just one individual with these problems could exceed £148,000 by the time they reach the age of 16. However, over the same time period, supporting an individual, via intensive family support, counselling in schools and Multisystemic Therapy2, could cost £32,000 – equating to nearly a fifth of the cost of current crisis services. Another costly issue examined in the report is adults facing employment challenges due to mental health problems. Mental health problems affect one in six adults at any one time, with costs of £45bn per year due to related unemployment and reduced productivity. At present, there are 1.3 million people with mental health problems who rely on benefits, yet many of this group would like to return to employment. The report argues that early workplace intervention by employers could reduce this number greatly. Specialist employment support for those out of work with mental health issues, as well as supporting employers to make workplaces more conducive to good mental health, have been shown to deliver savings of up to £2.50 for every £1 invested. A further key issue analysed in the report is chaotic families. The report estimates that 140,000 families cost society £12bn each year through reliance on public sector services and wider social costs. This figure could be greatly reduced by employing proven methods of intervention, for example, targeted support for families has an estimated cost of £19,500 for each family per year – an average saving of £40,000 annually per family. Moreover, these savings are dramatically increased in the case of the most problematic families, with savings reaching over £130,000 per year in some cases. Whilst the report shows that funders can vary greatly in their style of charitable giving – in terms of time, involvement and funds at their disposal – they are now in an increasingly advantageous position to ensure the funds they invest in a philanthropic cause can make a difference. However, there are also many considerations private funders must think about when making decisions about the charitable sectors they want to fund, such as their level of ambition, their willingness to engage with other partners and their attitudes to risk. In order to help funders decide how they are best suited to approach issues and interventions and what level of risk – or return – they are looking to take, the report outlines a framework to help donors make these decisions, based on their own ambitions and risk appetite. In addition, the report refers to distinct funder profiles, which range from the time-poor “Gift Givers” to the “Change Makers” – committed philanthropists willing to take risks on new initiatives. Emma Turner commented: “Private funders have an unrivalled capacity to fund initiatives that the government cannot. It is now clear that there is a growing group of enlightened funders, defined as Change Makers, who understand that the current method of responding to social problems only once they reach crisis point has limited success. This group of funders is willing to take risks on new philanthropic initiatives that address the root cause of problems, rather than just the visible symptoms. 1 £51bn relates to the cost of crime committed by adults who are estimated to have had conduct disorder in childhood. 80% of crime is committed by adults who had conduct problems as children, equating to around £51bn a year. 2 Multisystemic Therapy involves intensive whole-family support by a dedicated worker who visits several times a week for several months. The worker also liaises with schools and other agencies (youth offending teams, mental health services) to help solve problems in a holistic way. This is a great example of how to get your app right. This is relevant, its top quality, its good fun and its something that you want to share (although it could be more shareable, maybe sharing from the app would be an idea…I wanted to tell people about it but found it hard to). As you play the game you are reminded in subtle ways about how the boot helps you perform. At the F8 conference yesterday Mark Zuckerberg announced some changes to Facebook. He started by poking a bit of fun at himself (a bit of an unintentional pun there!). Short but sweet post this evening. 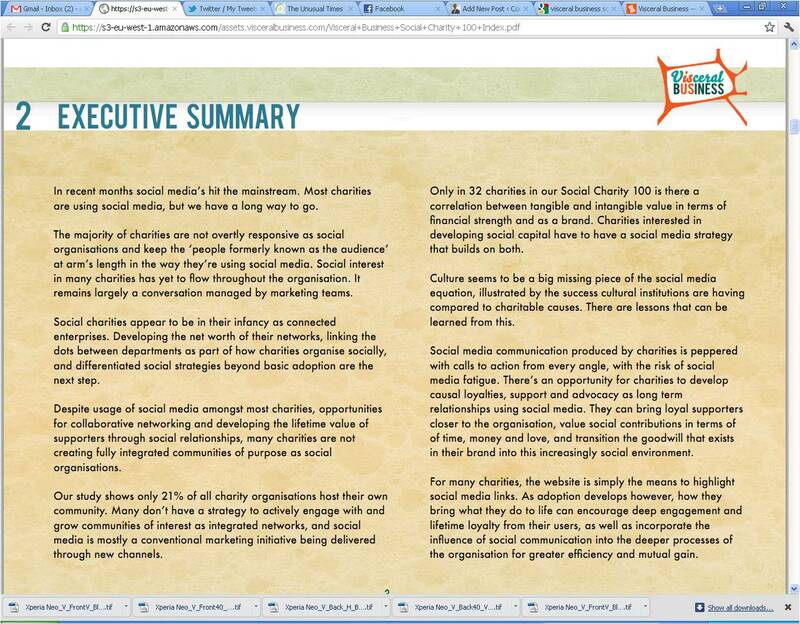 This is a report that is well worth downloading if you you want to be a social organisation. Some great tips and then a list of organisations who are doing it well…so follow them!